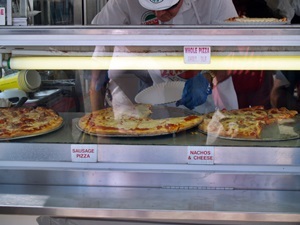 The Venice Italian Feast is a fest for the hungry reveler in you. 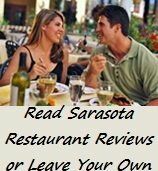 The Venice Italian Feast and Carnival is just one of those events you’re going to have to attend here along the Florida Sun Coast, especially if you're looking for some fun, food and entertainment...and you like being outdoors! 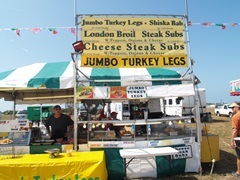 The yearly event takes place at the Venice Florida Airport Festival grounds which is next door to the Venice Municipal Airport. While the crowds can number in the tens of thousands it still doesn’t have that “over crowded” fee to it because the event is spread out over a 4 day period, usually Thursday through Sunday in late February each year. That helps in spreading out the crowds. In 2018 the Venice Italian Feast and Carnival celebrated its 30th anniversary and for 2019 it plans on being bigger and better than ever. One thing you’ll notice is that there are all ages in attendance. So, whether you’re a young family with some toddlers to bring along or a senior, you’ll feel at home at this community event; there are couples, singles, grade schoolers and high schoolers, who like to attend for the carnival rides, and just about every age group in between. Plus there’s also a daily and nightly full schedule of live music. 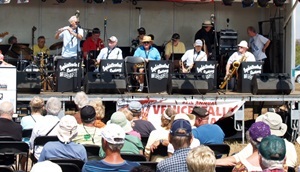 The live music caters to various tastes from swing jazz to rock to oldies to Doo Wop and Las Vegas Legends (music styles subject to change from one year to the next, but you get the idea.). They try to cover all kinds of music over the 4 days of the Venice Italian Feast and Carnival. 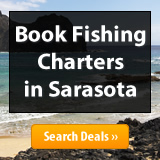 Plus you may even find some Tarantella dancers as well as some folk dancing. 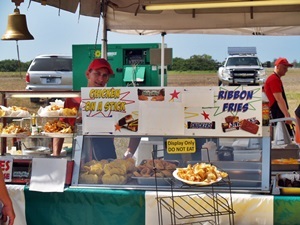 Of course the big star of the Venice Italian Feast and Carnival is the food; everything and anything Italian! 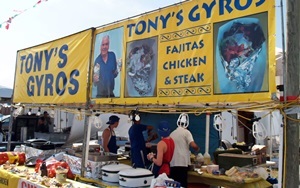 You might even find some barbecue and Greek specialties along the midway, which indecently is an old airport runway. 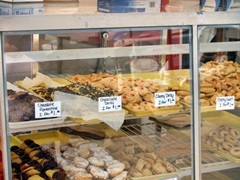 Here’s just some of what you’ll find being served up throughout the festival: sausage and peppers, meatballs, pizza and pizza fritta, pasta fagioli, zeppole, cannoli and other pastries. 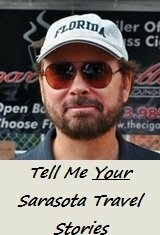 Plus you'll find chicken, Stromboli, ravioli, spaghetti, Italian ice and ice cream, plus ribs and gyros, cheese steaks, calamari, calzones, salads, Italian novelties and more. 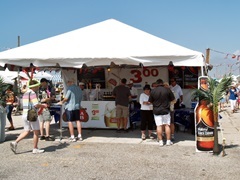 There are also beer and soft drink vendors to provide your favorite quaff. Prices depend on what you select, but are generally in the $5 - $10 range for from a sandwich to a full meal. 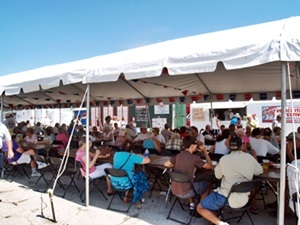 And there are plenty of tables and chairs, under tents, where you can sit down and enjoy your Italian meal. 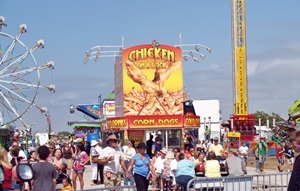 After your meal, if you so choose, you can hop some rides at the carnival Whether you’re more into the “nice and easy” rides like that of a Ferris Wheel or the rough and tumble rides that spin, rotate, climb and dive, bumper car, or a funhouse, there’s something to meet your desired level of adventure. 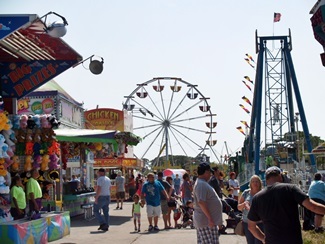 And there are plenty of rides for toddlers as well along with those good old fashioned carnival games where you can win a stuffed doll or animal. This is a nice event to attend, especially if you like being outdoors in nice, usually warm weather, among friendly people and the aromas of Italian food mixed in with the sounds of a nearby carnival. 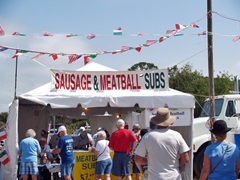 The Venice Italian Feast and Carnival is sponsored each year by the Italian American Club of Venice Florida, which does a nice job or organizing and hosting this, one of Venice, Florida's biggest yearly events. 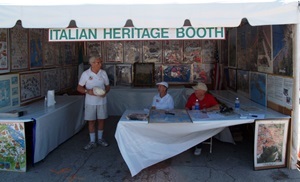 Here’s more on the Italian American Club of Venice Florida. 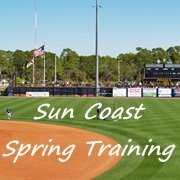 Date and Time: The event is usually held the third week of February: Thursday and Friday starting at 4 p.m. and Saturday and Sunday starting at noon. 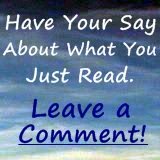 Cost: Admission is usually free. There’s usually a small parking fee. Location: Venice Airport Festival Grounds, next to the Venice Municipal Airport. 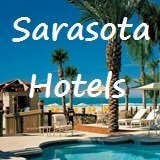 Directions: From Sarasota follow Rt 41 south to Venice. Don’t take the 41 bypass but take 41 into and through Venice. Follow the traffic and signs that are usually posted along the streets directing you to the event. 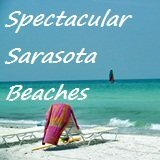 Sarasota Events Calendar Main Page.